CF-DJA at Chilliwack - CYCW, British Columbia. CF-DJA at Abbotsford - CYXX, British Columbia. CF-DJA on a very busy ramp. • JW 9106 Tanzanian Air Force. Delivered 21-Mar-1966. Based at Dar es Salaam. Withdrawn from service Apr-1972. Accident: Chinya, Tanzania. 29-Dec-1969 Damaged but was repaired. • CF-DJA Bannock Aerospace Ltd., Toronto, ON. Regd circa May-1972. • CF-DJA Airstol LLC., Carp, ON. Regd 24-Aug-1972. • CF-DJA Fischback & Moore Canada Ltd., Toronto, ON. Regd Sep-1972. • CF-DJA Bannock Aerospace Ltd.,Toronto, ON. July 1973. • CF-DJA Sardis Land & Development Company Ltd., Chilliwack, BC. Regd 6th August 1973. • CF-DJA Private owner in the Bahamas. Details unknown. Accident Noonan, ND USA. 25-May-1980. During delivery flight to Smithers, the aircraft had taken off from the Border International Airport at Mandan, ND., and was landing at Noonan, ND., with the wind gusting to 30 knots, when the left gear failed and the Otter struck a fence. The pilot Emil Mesich was uninjured. (See narrative below for the further information on the recovery). • C-FDJA During 1981, the Otter was registered to and flew for Air BC. • C-FDJA Central Mountain Air Services Ltd., Smithers, BC. Regd circa 1982. Canx 16-Jan-1989. Accident: crashed at Two Bridge Lake, 25km NE of Smithers. 18 Sep 1982., Destroyed. Regrettably the pilot was Emil Mesich. (Further details in narrative below). • C-FDJA Removed from Canadian Civil Aircraft Register 16-Jan-1989. Otter 459 was delivered to the Tanzanian Air Force on 21st March 1966 with serial JW 9106. It was crated and shipped to Tanzania where it was re-assembled and entered service, based at Dar es Salaam. The history of the Tanzanian Otters has been explained in relation to Otter 451. Of the eight Otters involved, three remained in Canada and were used for training purposes, but the other five, including 9106, went to Tanzania and entered service. 9106 was damaged in an accident at Chinya in Tanzania on 29th December 1969 but was repaired and continued in service until April 1972 when the five Otters in Tanzania were purchased by Bannock Aerospace Ltd., ofToronto, Ontario. CF-DJA and 9107 (460) CF-DIZ. Four of these Otters passed through Shannon Ireland on the delivery flight home, the fifth passing through Prestwick in Scotland. CF-DJA and CF-DIZ came through Malta together on 25th July and through Shannon on 26th July, next stop Reykjavik and onwards via Greenland and Newfoundland to Toronto. DJA was sold by Bannock Aerospace on 24th August 1972 to a company called Airstol of Carp, Ontario and in September 1972 it was registered to Fischback & Moore Canada Ltd., of Toronto, who in July 1973 transferred it back to Bannock Aerospace Ltd. The following month, on 6th August 1973, it was sold to Sardis Land & Development Company Ltd., of Chilliwack, BC for $105,000. This was a company owned by a Mr Wally Johnson, based at the small airport of Chilliwak, BC., near Vancouver. He also owned a number of other companies, and the Otter would be used for both private and company business. He had a lodge at Babine Lake north of Smithers, BC., to where the Otter often flew. 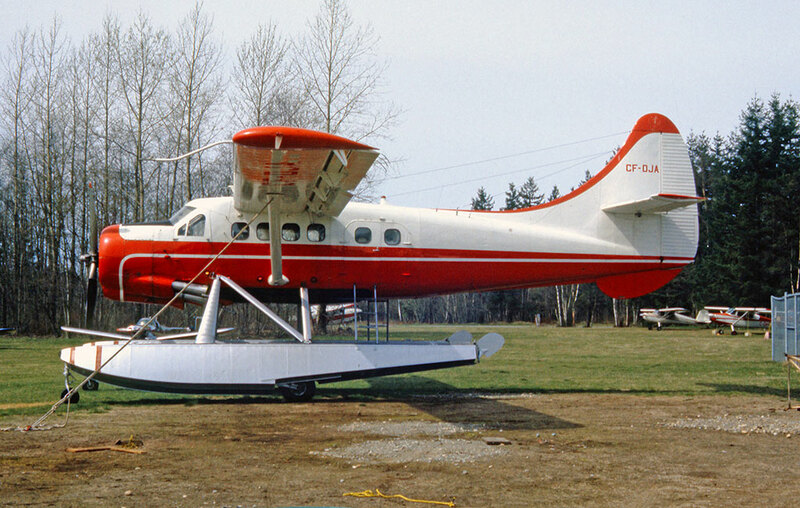 DJA was converted into an “executive Otter” in Toronto, with four seats taken from a de Havilland Dove installed in the cabin, two facing back and two facing forward. It also had four normal Otter seats to the rear of the cabin. It was delivered from Toronto to Vancouver during September 1973 in a flying time of 25.7 hours, on straight floats. Its cross-country routing was as follows: 5th September Toronto to Sault Ste. Marie (3-35) and Sault Ste. Marie to Lakehead (3-55); 6th September Lakehead to Winnipeg (4-35), Winnipeg to Regina Beach (3-35) and Regina Beach to Chestermore Lake, Calgary (3-50); 7th September Chestermore Lake to Nichola Lake (4-40) and Nichola Lake to Cultas Lake, Chilliwack (1-25). At Vancouver, the Otter was put on amphibious floats and for the next five years was based at Chilliwack and flown for Mr Johnston and his companies. Mr Johnston died in 1978 and the following year his Estate sold it to a private person in the Bahamas for $209,000. 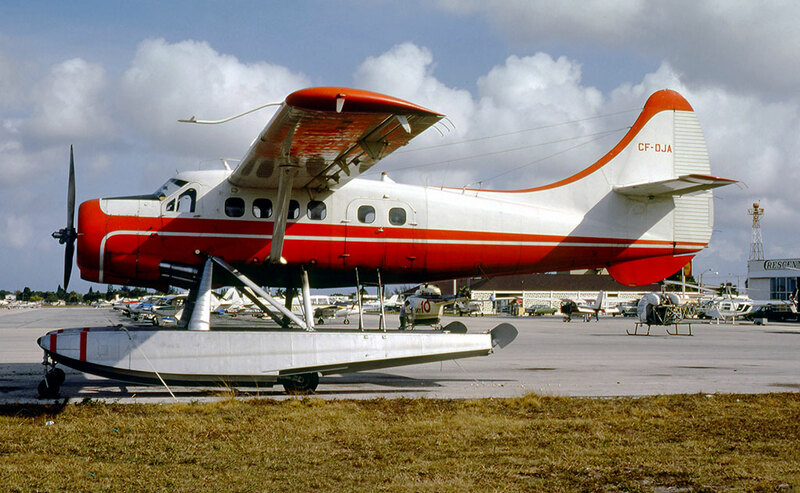 It stayed in the Bahamas for a year, although it remained on the Canadian register, and was then sold to Smithers Air Service Ltd., of Smithers, BC to replace their Otter CF-JIK (229) which had crashed. 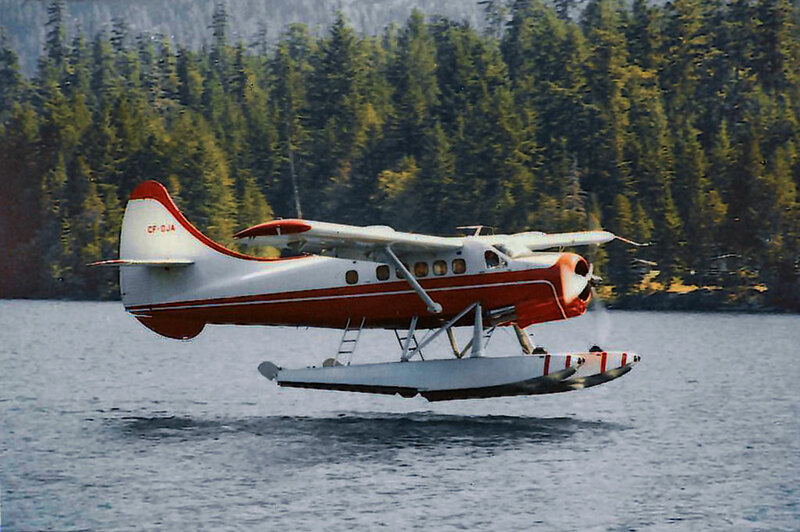 The Otter was on its delivery flight back to Canada, flown by pilot Emil Mesich, the owner of Smithers Air Service, when it met with an accident on 25th May 1980. DJA had taken off from the Border International Airport at Mandan, North Dakota and was landing at Noonan, North Dakota with the wind gusting to 30 knots, when the left gear failed and the Otter struck a fence. The pilot, the only occupant, was uninjured. This incident is mentioned in Denny McCartney's book “Picking Up The Pieces”, as he was called in to fix the Otter. He flew from his Vancouver base to Saskatoon, where he picked up a U-Drive and headed for the border. Arrangements had already been made to deliver a wheel landing gear to the scene, which was put on the Otter, replacing the damaged amphibious floats. Repairs to a wingtip were also needed. The Otter could then depart, on 29th May 1980, flying first to the Estevan Airport, Saskatchewan en route to Calgary for final repairs by Kimba Air Service. 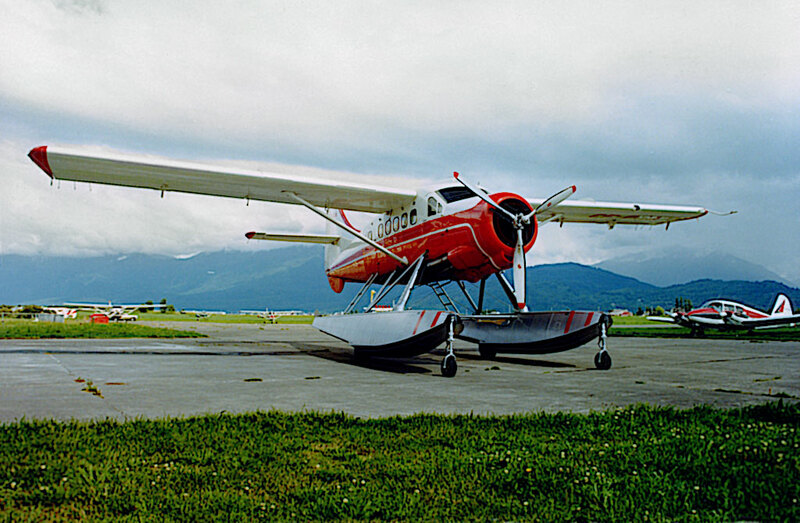 The Otter was then registered C-FDJA to Smithers Air Service Ltd of Smithers, BC and entered service with that company. During 1981, the Otter was registered to and flew for Air BC. The following year it was acquired by Central Mountain Air Services Ltd., of Smithers and was operated by that company when it crashed at Two Bridge Lake, twenty five kilometres north-east of Smithers on Saturday 18th September 1982, and was destroyed. 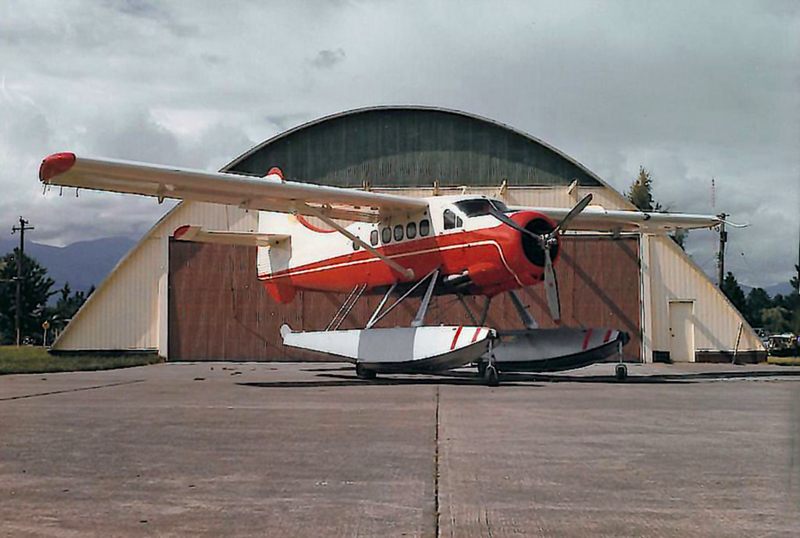 As the accident report records: “Two company aircraft, each carrying a party of hunters, departed the seaplane base on Tyee Lake near Smithers, bound for separate camps located relatively close together. The Otter was bound for Tatlatui Lake, 260 kilometres to the north. DJA, the larger of the two aircraft, was loaded with equipment belonging to both groups. As well as the pilot and four hunters and this equipment, it also carried two 200 litre fuel drums. The pilot was to drop off his passengers and then fly to the other camp. He did not arrive. An ELT signal was heard by the pilot of the smaller aircraft on his return flight to Tyee Lake”. The Otter had crashed ten minutes after take off. The wreckage was located in a canyon several miles east of track, lying upside down in a heavily treed area in the Driftwood Canyon. Witnesses saw the Otter cruising at low altitude and photographs taken by the passengers confirm that it was flying along a valley, well below the level of the surrounding terrain. The pilot flew into a confined area and the over-loaded Otter could not out- climb the slopes ahead. In an attempt to reverse course, the pilot initiated a steep turn. The Otter stalled at an altitude too low for recovery, crashed and burned, killing the pilot and his four passengers, who were visiting hunters from Chicago. The pilot was Emil Mesich, who had also been the pilot of Otter CF-JIK (229) when it had crashed in November 1979. He had been the owner of Smithers Air Service, which had gone into receivership after that crash.